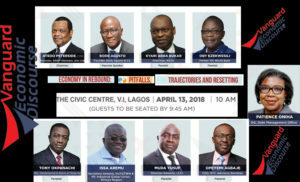 Financial experts, economists and other leaders of thought that gathered at the 2018 Vanguard Economic Discourse have disagreed on the level of compliance by Nigerians with regards to tax payment. They also expressed divided opinion on the ability of the federal government to generate more revenue from the Voluntary Assets and Income Declaration Scheme (VAIDS) recently launched by the government to enforce tax compliance. Speaking on the theme of the Discourse: “Economy in Rebound: Pitfalls, Trajectories and Resetting”, Dr. Bode Agusto, the keynote speaker, said that one of the ways the government would fix the economy is by enforcing tax compliance and relinquishing its control over infrastructure spending. Agusto said that the drive by the federal government, FG, to improve tax compliance and consequently tax revenue through VAIDS will not suffice as the bulk of the benefits will go to states. He urged the government to go after owners of small businesses that evade tax, even as he said that compliance on personal income tax is largely lacking. Disagreeing with him, Muda Yusuf, Director General, Lagos Chamber of Commerce and Industry, said that tax payment should be approached from the perspective of the economic structure. “This economy is a dual economy. When I say dual, it is principally the formal sector of the economy and informal sector of the economy. The formal sector of the economy is over taxed. When you talk of taxation, it is not just about the conventional tax, company tax, etc. Businesses pay a lot of levies and fees annually. “These things put a lot of burden on businesses. We have a situation where we have almost 50 percent of the informal sector who are not captured in the taxation policy or in the tax length. We have a few informal sector percentage providing tax revenue to support the economy. The issue therefore is about broadening the tax length and making sure that we get the other segment of the economy to also be on board,” Yusuf said. Tony Okpanachi, Managing Director, Development Bank of Nigeria, DBN, empahsised the need to make the teeming youth population more productive if the government hoped to generate additional tax from them. In his words: “If you look at the demography and the composition of the population, you we will discover that most of them are youths. Speaking on the ability of the government to generate more revenue via VAIDS, Agusto said: “To improve tax compliance and consequently tax revenues, the government has embarked upon a Voluntary Assets and Income Declaration Scheme (VAIDS). In my opinion, the bulk of the benefits of this scheme will go to the states and not the FG. This is because the greatest tax evaders are individuals and the relevant tax authorities for the administration of Personal Income Tax in Nigeria are the states. In her submissions, Mrs. Patience Oniha, Director General, Debt Management Office, DMO, said: “Talking about tax, I think the informal sector is about 60 per cent of the GDP, if the figures from the National Bureau of Statistics, NBS, are accurate. So, certainly there will be some revenue that will accrue under the VAIDS, from entities that are registered as companies but haven’t been paying tax may be due to the fact that enforcement has not been as aggressive as it is now. So, I believe both the FG and state governments will get some money from there. The post Vanguard Economic Discourse: Experts divided on tax compliance appeared first on Vanguard News.